His small leather-bound notebook is filled with sketches, notes, measurements, paint swatches, project ideas—and some French writing and a bicycle training diary for good form. What is most revealing is the range of work William Caligari does, from detailed decorating to reimagining and redesigning the layout of a gutted house. The Caligari family business goes even further back to the 1890s, when his grandfather immigrated from Chivena in northern Italy. He started a paint contracting business in Great Barrington that has expanded through the generations. 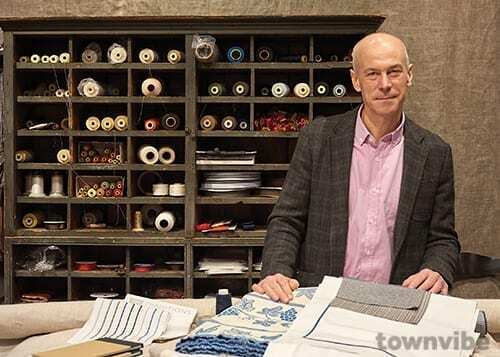 William and his brother Jeffrey are partners in the businesses that include E. Caligari and Son in Great Barrington (opened in 1954), Caligari Hardware in Lenox (mid-1960s), Taylor Rental in Great Barrington (early-1970s), William Caligari Interiors (1989), and Linen (2012). Jeffrey’s daughter, Kaitlyn, 30, manages E. Caligari, bringing in the fourth generation. William studied at the New York School of Interior Design and worked in the city for eight years. He was—and still is—heavily into bicycle racing, and in early 1989 lived for four months in Medellín, Columbia, where he rode with a team and competed. He found his way back to the Berkshires in June 1989 and opened Lenox Design Resources, adjacent to his family’s hardware store. 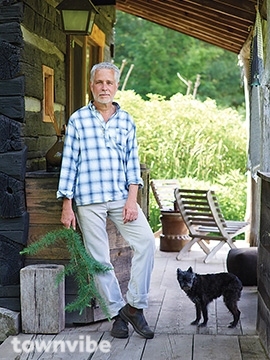 In 2003, his business moved to Great Barrington and was renamed William Caligari Designs. The company grew to 15 employees before shrinking to two during the financial crisis of 2007-2008. That’s when Caligari traveled to North Carolina to take classes at Custom Home Furnishings Academy, learning to sew and run a workroom. He opened Linen, which helped him pull out of the hard times “and kept my head together,” he says. His business shifted to mostly renovations, mostly regional, building upon and deepening the close working relationships he has with his clients and some of the finest fabricators and artisans in this tri-state region—from stone craftsmen to wallpaper experts, furniture designers to landscape professionals. “These people account for a lot of my successes,” he says. Caligari is in the midst of designing a new business on Main Street in Great Barrington. The forthcoming Calyx Dispensary, located in a building that his family owns, sits between Tom’s Toys and the law office of Cain, Hibbard & Myers. Still going through the local and state approval process, Calyx is expected to open by August. It’s a collaboration between Caligari and the architect, Diego Gutierrez in Housatonic. Caligari is producing all of Calyx’s working drawings, space planning and autoCAD. “Bill came in with a strong idea of the space and what he wanted to see as far as texture and curves,” says Gutierrez, who did the conceptual layout. Calyx and Berkshire Roots in Pittsfield are a new type clientele that make Caligari’s design work even more dynamic and interesting. “It’s such a rapidly changing and evolving businesses. It’s not like designing for a company that sells tires. Packaging is changing, new products are coming online rapidly. It’s like designing a store for calculators in 1968.” The goal is to make Calyx look bright, inviting, colorful, intriguing to customers, “but you don’t want it reek cannabis,” says Caligari. What passers by will be able to see is a reception area, then a curved wall and frosted glass that conceals what is inside, which is the retail space.